George Mason University’s Homecoming basketball game is one of the most highly-anticipated games of the season as students, faculty and staff, friends, and alumni gather together for a week of celebrations. Today, we’re delighted to introduce Dawn Hicks, Director of Community Relations with George Mason University Athletics. 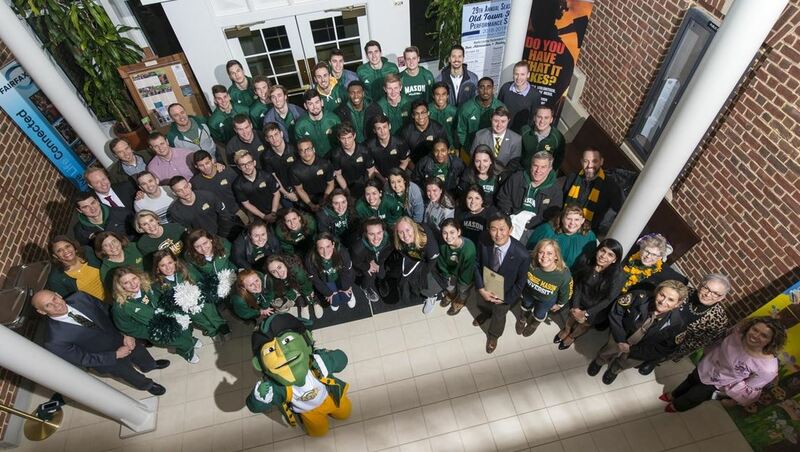 Dawn wrote a guest blog post on the University’s collaboration with Fairfax City for GMU’s 2019 Homecoming. Be Brave. Be Bold! Go Green. Go Gold! In celebration of Mason’s Homecoming Week, the City is getting decked out in green and gold! The pom-poms are hung in Old Town Fairfax, the banner is proudly displayed in Old Town Square! This week, Mason students and student athletes will “Paint the City Green” by decorating 25 City storefront windows with their own original green and gold designs – and they could win a prize! Fairfax City Mayor Meyer and Councilmembers will select the top three designs; winners will announced at Mason’s men’s basketball game on Saturday, February 23 at 4:00 PM. Visit Paint the City Green to see participating businesses and gomason.com to purchase game tickets. Don’t forget to celebrate with the 32 City businesses who are offering special discounts to the entire University community – students, staff, faculty, administration, and alumni – from Monday, February 18th to Saturday, February 23rd. To view and download a map of participating businesses, visit “Patriots in the City”. A valid Mason I.D. or Mason Alumni Homecoming alumni pass is required to redeem all offers. Error: Error validating access token: Session has expired on Tuesday, 21-Aug-18 08:56:08 PDT. The current time is Sunday, 21-Apr-19 21:30:40 PDT.